Oh, I am so sad to report that today is my last full day of vacation. Well, I am on vacation tomorrow, too, but it is more of a travel day so it does not really count in my head. Where did the last week go!? It went by so quickly and it was so much fun. The bartender might have thought it was a little weird that I was laughing at the pint glass, but when I said, “So, do I look like I’m from Boston?” he got it. He was pretty surprised that I was from Boston and that I was served in the last existing Red Sox glass that the bar had. I loved this beer, and this glass. 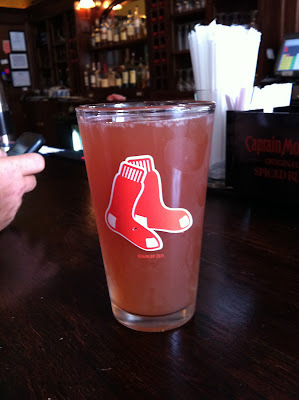 The bar tender offered me the glass, but I did not want to take the last Red Sox pint glass they had. It just did not seem right – I hope the next time I am there they will serve me a beer in it again! The other night AFM and I had some very exceptional pizza. DeFazio’s Pizza is in Troy, New York. (266 4th Street to be exact!) It has won a lot of awards and is commonly known as the best the wood fired pizza in upstate New York. They have also won national awards. If you are ever in the Troy area, or taking Route Seven to Vermont to ski, or visiting RPI or Union College swing by DeFazio’s – it is really great! I had only two pieces of the pizza last night – but we have a couple of pieces left over and I think I might have another one tonight. 🙂 I cannot say no to good pizza. It has been quite a week. I could definitely use another week of vacation, but alas, I have to go back to work on Tuesday. It’ll be a long haul until my next mini-vacation which I hope will be around Thanksgiving. I am really looking forward to the holidays this year – especially since I was so sick and basically missed all of the holidays last year. This year the holiday season is going to be very special to me. But before we get to that season, let’s enjoy fall. Ok, I’m off. Hope you are all having a great weekend. See you in a bit! Sounds like a good time with good food. DeFazios was featured on the food channel some time ago. Sounds like it lived up to it’s reputation. I’d have said “thanks” and taken the Red Sox glass!